After giving cashless wristbands a trial run at the 20,000-person Counterpoint Festival in Atlanta in April and then launching a major test at the 100,000-plus Lollapalooza Festival in Chicago in August, Austin, Texas-based C3 Presents brought the technology home in early October to Zilker Park for the Austin City Limits Festival. And you can bet there were plenty of bottles of Shiner Bock popped after the two-weekend gathering concluded, because the RFID-based technology was a smash hit with fans and C3’s front office. “It went fantastic at Counterpoint and Lollapalooza and the number one thing we learned from Lolla or any festival is born out of [users] spending less time in line and more time in front of the stage. That’s the number one selling point,” said Patrick Dentler, Marketing director for C3. 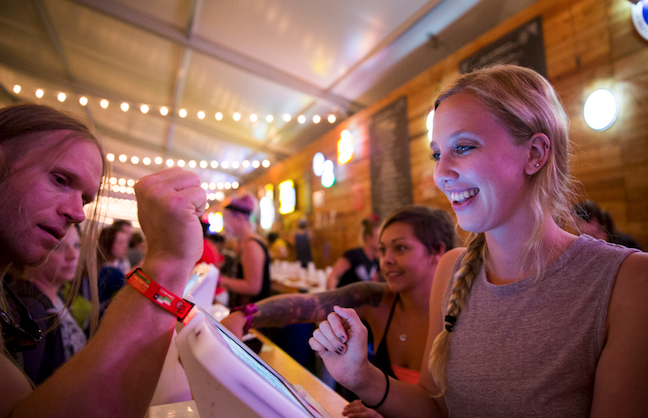 The optional system created by Austin-based partner Front Gate Tickets allowed fans to use their R.F.I.D.-chip implanted festival wristbands to purchase food, alcohol and merchandise by either preregistering the wristbands or registering them on site. Each chip contained the patron’s credit card information and a unique PIN, which Dentler said cut down line waits for food and beverage. That final figure was much higher than Gibson was expecting, and it beat the 33-percent adoption rate at Lolla. “We had close to 90 percent of attendees register their wristbands and of all people who registered, 45 percent put their credit card information in,” she said, noting that you can register without signing up for the cashless option. C3 did learn some lessons from the Counterpoint rollout, though, which lead to some tweaks for ACL. From a logistical standpoint, Dentler said they realized that they needed specific lines and signage pointing to cash/credit card points-of sale-and one for cashless to keep both lines moving. But cashless payments were just one point of the wristband activation, which asked users to sign in and give their names and contact information as well as emergency contacts. “If something happens to you, medics can scan your wristband and call your first emergency contact,” Dentler said of another function of the RFID technology. In the future, the wristbands could potentially hold medical information as well in the event of an emergency, including drug allergies and other life-saving data. “Safety seems to be a big issue for fans,” said Dentler. “Making fans safer that way is priority number one.” But there are also some interesting opportunities with social media, including a program Front Gate is working on with photo booths or portrait areas where fans can assign social media accounts to their wristbands that will allow them to email photos and share them on Facebook or their other feeds. Sponsors also seem interested in replacing the old-school pen-and-paper on a clipboard-method of signups for flyaways and other promotions with scan-and-move-on swipes of the wristbands, taking several minutes out of the process. Gibson said there was no additional cost involved in adding the new data to the wristbands, other than the time, effort and software development that was done in-house at Front Gate. 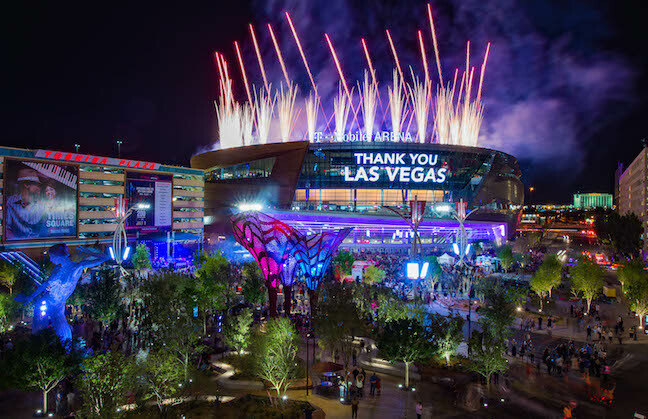 As for what patrons used the new technology for, she said “everything,” with some anecdotally telling her that they used it for all their on-site purchases of food, beverage and merch. Right now C3 is not forcing RFID activation on sponsors, but is working with them to develop campaigns and promotions around it in an effort to get their partners to embrace the technology. At ACL, he said they had close to 90 percent of attendees register their wristbands, a huge win on any scale. In an age of third-party resellers and counterfeit tickets, Dentler said another bonus of the RFID wristband is that if the owner loses it or damages it, the device continues to be associated with their names and information. “The biggest benefit for us was tackling the grievance that we had in the festival business from day one: lines,” said Dentler. “There are only so many places at festivals where lines form and being able to get in front of a bar, merch booth or food booth – which take up a lot of real estate and attract fans at all times of day – you need something that can service [patrons] quickly and easily. As with any new technology, there are always concerns with the safety of personal data, an issue to which Dentler said Front Gate and C3 are sensitive. “There are three different forms of encryption on the wristband and the personal data is not on the band itself,” he said, noting that the data is protected by a PIN.